I'm so excited to have TWO new releases to share with you this month!!! 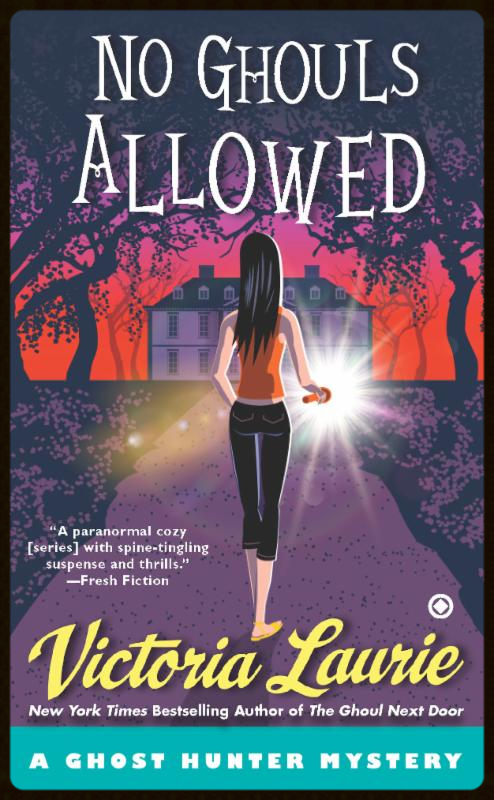 Click this link to pre-order your autographed copy of No Ghouls Allowed and When. M. J. Holliday here to wish you all a Happy New Year, and also to talk a little shop! A few months back, Heath, Gilley, and I drove down to Valdosta, Georgia - my hometown - to attend the wedding of my daddy and his new bride, Christine Bigelow, a lovely woman and a perfect fit for Daddy. The trip was set up to be a nice little hiatus for the three of us, and trust me, after a few years of dodging murder and mayhem, we were all in the mood to have a break from the business of busting some spooky ###. However, having a laid-back vacation was not exactly the way things unfolded. Story of my life, right? Turns out that the old family mansion that Christine had purchased, and had begun renovating, was home to one of the most powerful and deadly demons we'd ever encountered. Of course, when Christine asked us to look into the haunted old place, she had no idea that we'd soon discover that my own mother - who died when I was eleven - appeared to be mixed up in the disappearance of a little boy last seen forty years earlier at that very mansion and was somehow at the root of the hauntings. As you've probably guessed, things only got worse from there. In short order we had our collective assess handed to us a few times by not one, but two nightmarish spooks, intent on sending me across the Rainbow Bridge to hang out with Mama. What can I say? It was a looooong week. I'd tell you more, but Victoria Laurie interviewed us right after we got back to Boston, and she has nicely chronicled our exploits for all of you in her new book, No Ghouls Allowed. You can read all about it beginning tomorrow, January 6th! One note of caution, however: This tale is freaky scary. And I can say that because I (barely) lived through it. You might want to read it with the lights on... and perhaps a fresh pint of Ben and Jerry's at the ready. Just sayin'. "The newest Ghost Hunter adventure from talented and prolific Laurie explores M.J.'s family heritage. The early loss of her mother created a wall between M.J. and her father, but now they have a chance to reconnect --provided the Sandman doesn't get them first! Hang on tight, for Laurie is taking haunted houses to a new level!" I'm new to the group, but I'd like to take a moment to introduce myself. My name is Madelyn Fynn - Maddie - and I'm currently attending Poplar Hollow High in Poplar Hollow, New York. Don't worry if you can't find that on a map; Google doesn't seem to recognize it. Anyway, ever since I can remember, I've seen the world a little differently. I can see what no one else can. When I look at someone - be it somebody standing in front of me, or in a photograph, or on a movie screen - I see a series of digits floating just above his or her brow. I learned the hard way, after my dad was murdered, that the digits represent the date that person will die. It's a terrible "talent" to have because in absolutely every face I look at, I see death. Sometimes the person I'm looking at has far less time than they, or anyone else, might think. I'm like the Grim Reaper incarnate, and it's awful. Worse yet, telling someone their date has never had an effect on the numbers. They've always remained stubbornly fixed, no matter how much warning I give a person, which is a whole other awful thing to have to live with. If knowing when someone will die won't change anything, then why am I cursed with the ability? Seriously, what's the point? Still, Ma and I are trying to make the most of it. We charge people a little money to tell them their date, and it helps to pay the bills, and maybe it gives them time to get their affairs in order, or to live a more fulfilled life. Trouble is, Ma is drinking away most of the extra money, and recently a woman came to me asking about her young daughter, who is very, very sick. I had good news about her daughter. She'll get better and live a long life ... but the woman's middle son is a whole other story. His deathdate was yesterday, and now he's gone missing, and the FBI just came to my school and wants to have a word with me. Things are about to go very, very bad, I think. To read what comes next, maybe you'll pick up a copy of When, which comes out next Tuesday, January 13th. In the meantime, if you're intrigued by my ability, maybe you should ask yourself: if someone could tell you your deathdate, would you want to know? ***Television rights for When have already been optioned by Warner Brothers! "The tension inexorably mounts as Maddie faces heartbreaking choices. Readers will root for Maddie not only to find the killer, but to gain a little happiness, too. Laurie's debut for teens is quite an accomplishment: Maddie's voice rings true, and her character development is handled well. The character development is just as riveting as the plot in this well-constructed thriller." 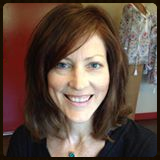 Appointments for Psychic Readings with Victoria - Now Available! So, if you're curious about what 2015 has in store for you, click this link to connect to the sign-up page. Appointments are limited, and they go rather quickly. If you think you'll want an appointment for the new year, sign up now rather than wait because, as history has taught me, once my new releases hit shelves, I'm usually flooded with bookings, and those January and February sell out fast! Book Signing at Murder by the Book! After a year away, I'm SO excited to once again join the amazing staff at Murder by the Book for the dual signing of No Ghouls Allowed and When! For more information on this event or one of the many other awesome author events they host, please visit MBTB here. **If you pre-order an autographed copy of WHEN or N.G.A., you may expect your books to arrive the week of January 19th. Victoria will be signing all pre-ordered books at MBTB on January 17th. If you would like Victoria to personally inscribe your copy, please note that in the comments section when you place your order. International shipping is available, and inquiries for international ordering can be sent via email to order@murderbooks.com. Greetings and salutations, my good friends! Gilley Gillespie here to announce the BRAND NEW RELEASE of the latest, (and greatest) Ghost Hunter Mystery,....drumroll please,....dum-dum-dum-dum-dum-dum,....(that's enough drumroll! )...The Ghoul Next Door! As usual, Victoria Laurie has tracked our every move and written down this fiendishly fabulous tale of murder! Mayhem! And, men without shirts! ANYghoul, you're probably wondering what we were up to this time around, right? Well! It was FREAKING SCARY, y'all! Like...all-the-lights-on and boyfriend/BFF/Mommy-on-speed-dial kind of FREAKING SCARY! And I'm just talking about the fact that M. J. 's ex, (Dr. Steven Sable), paid my BFF a visit on a bad hair/wardrobe day! As for me, I wanted no part of this dangerous ghostbust, but we all know how stubborn M. J. can be when there's a friend/ex-boyfriend in need. Heath wasn't too happy either - for obvious reasons....(you could've gotten high on all the testosterone fumes on this bust.) But we managed to pull it together for the sake of old friendships, (mental note: check with M. J. to make sure we got hazard pay for this bust.) I still don't quite know how we managed to stay alive and keep our sanity...no, really, I haven't read the whole book yet so I still don't know how we managed to stay alive and keep our sanity, so to find out you'll just have to pick up a copy for yourselves! I'll be sure to send out a second little reminder next week as I know a lot of you are off work and busy with family and such this week, but in the meantime, Happy Hollidays and here's wishing you a glorious New Year! Houston Area Peeps, I'm coming to see YOU! Oh, how I MISS my beloved Texas!!! So much so that I'm traveling south to my faaaaavorite bookstore, Murder By The Book this coming January 11th! I'll be there from 4:00 p.m.
to close, so please stop by if you're in the area! For more information, please visit Murder By The Book's Web site, and I hope to see you there! Psychic Readings - Back By Popular Demand! Anyhoo, I'm opening up my schedule from January through March for some phone sessions, and, because I know many of you are watching your budgets, I've even lowered the price! Also, please double and triple check your information when signing up; we've had mix-ups in the past with wrong phone numbers or missed appointments due to time zone confusion. There are links on the sign up page to help you with all of that, so please make sure you know exactly what time slot you're purchasing, and that I have the correct number to call you on the date and time of your session. In the meantime, I look forward to chatting with many of you in the coming weeks! was perhaps the last you'd see of my little Abby Cooper, and I want to make sure you all know that I have maaaaaany more Abster adventures planned! In fact, this summer Abby finds herself in trouble once again with the July release of Fatal Fortune! To give you just a hint of what's in store, Candice - Abby's BFF - has been accused of murdering someone in cold blood. In fact there's even video of the event - undeniable proof that Candice isn't who she claims to be and in fact could be a mafia hit man? Hit woman? Hit person? Maybe! Tune in July 1st, 2014 and see! Catherine Cooper-Masters here to welcome you to the wedding of Roland "Dutch" Rivers and his beautiful bride-to-be, Abigail Cooper. Also, if anyone has seen the bride, would you be so kind as to get word to me? I'm sure she's just fine, perhaps a few wedding day jitters have led my sister to seek a bit of solitude before she takes that magical walk down the aisle....and the fact that no one has seen her since this morning isn't anythingto worry about, I'm sure! Still, if you do spot her, call me immediately, won't you? I've got armed guards standing by ready to tackle her...uh...er...I mean, I've got some dear friends ready to assist her through hair and makeup. In the meantime, please enjoy the hors d'oeuvres...in fact, please hurry and enjoy them as one of the wedding guests, (that short little man who came with M. J. Holliday...Gilley is his name, I believe), appears to be devouring all the amuse-boushe! Oh! That gives me an idea! M. J. is a psychic too, perhaps she can tell me where my sister's gone off to! Victoria will be returning to the fabulous Murder By The Book Bookstore for the launch party of Deadly Forecast! If you're in town, stop by to listen to her read from her latest Psychic Eye Mystery! Victoria will also once again be giving lucky audience members mini psychic readings, so if you have a burning question you'd like to ask her, now's your chance! 1.) Click the book to the right and select it and any other book(s) you'd like to purchase. Hey there, my lovely fans! Just wanted to take a quick minute to talk to you about the exciting news thatDeadly Forecast will be available for Audible pre-order through one of my very favorite Web sites, Audible.com! Anyhoo, I've got a few links to share here for the audio books: the first of course is that pre-order link for Deadly Forecast, which is here. And for those of you who might like to start off with an earlier book, here's the link to to the entire series. The paperback version of Lethal Outlook is now available! If you haven't had a chance to catch up with Abby's last adventure, now's your chance! Order your signed copy today from Murder By The Book using this link. Big news for you YA (young adult) fans! 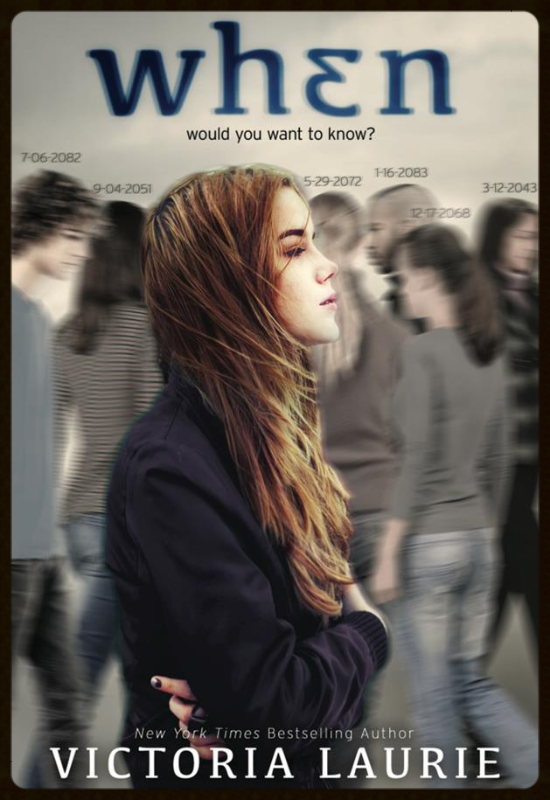 Victoria's YA debut will be published by Hyperion Books and is set to release late 2014/early 2015. The novel - Death Date- features a new character named Maddie Fynn. Maddie is a 17 year-old with a peculiar psychic ability - she's able to see the exact date people will die, but nothing about how it'll happen. When her town is threatened by a serial killer, Maddie must try to dodge the suspicions of law enforcement and the deadly interest of the killer before her own time runs out. Check out Victorialaurie.com for updates, fun videos, news, and more! Holliday, (ha, ha...I'm punny!) and to announce the release of What A Ghoul Wants by Victoria Laurie, available this coming Monday, December 24th, 2012! As it turns out, what a ghoul actually wants is a little piece of me! (I can't say I blame the ghoulies...I'm simply irresistible in my holiday finest, you know...) M. J. says it's because I emit some sort of special electromagnetic frequency, but I think it may just be my cologne. Anyghoul, Victoria has been kind enough to document our harrowing encounter in the North of Wales with a particularly pesky poltergeist named, The Grim Widow. She's a looker that Widow. And by "looker" I mean; she looks a bit like the Grim Reaper in drag. But twice as mean. We're talking oooogley! The Widow haunts Kidwellah Castle - a castle turned hotel and the latest location shoot for our ghostbusting cable TV show. Obviously Gopher booked the place without consulting me...ahem...and the result was all sorts of chaos. The minute we arrived, guests of the establishment began to turn up dead - drowned in the moat surrounding the castle. wee bit spooky. So, don't read page 21 alone or in the dark. Or page 43. Or pages 83 - 88. And especially not pages 116, 121 - 137, 181 - 183, 258 - 272, 283 - 289, or pages 311 - 323! For those of you who miss Steven, do read the teaser at the very end for the next Ghost Hunter Mystery, The Ghoul Next Door. You'll be glad you did! Until next time, Happy Hollidays to you and yours, and a Happy New Year too! For those who love Gilley and all things Gillespie, (Gilleshpie!) here's a list of things that give Gilley the WEIRDS! (Katy, TX) Please click this link for location address and details. Saturday, December 29th, 11:00 a.m.-12:00 p.m.
For those of you in the Katy area, come by and pick up your copy of the newest Ghost Hunter Mysteries book. Victoria will be reading from What a Ghoul Wants and do a few psychic readings for the audience as time allows! (Houston, TX) Please click this link for location address and details. Saturday, December 29th, 4:00 - 6:00 p.m.
Victoria will once again be visiting the fabulous Murder By The Book bookstore!!! She'll be signing books and treating lucky audience members to mini psychic readings! other book(s) you'd like to purchase. Jill Smith at Romantic Times gives What a Ghoul Wants four stars! "The Ghoul Getters gang heads back to Europe in the latest installment of Laurie's long-running Ghost Hunter Mysteries. M.J., Heath and Gilley have faced dangerous spectral threaths oplenty, but this may be more than they can handle!" "Keep the lights on while reading, for the Grim Widow is one exceptionally vicious and scary ghost!" "Laurie nicely balances goofiness and terror in her delightful seventh Ghost Hunter mystery, (after 2011's Ghoul Interrupted). M.J. Holiday, Heath Whitefeather, Gilley Gillespie, and the rest of the investigative team for cable TV's Ghoul Getters explore Wales's haunted Kidwellah Castle, home of the ghostly Grim Widow, who's strong enough to physically grapple with the living and is known for drowning victims in the castle moat. Determined to close the Widow down and free other ghosts the Widow has trapped, as well as expose the living people involved with these murders, M.J. and company dig into the history of the insane Lady Jane and her duke, whose spirit foretells death to those who see him. Romantic developments for M.J and Heath as well as for Gilley and a new beau will please series fans, while newcomers will slip into the story with ease." It's said to be good luck if it rains on your wedding day, but Abby sees something darker than storm clouds on the horizon. She's just had a disturbing premonition of her fiancé's murder. Her husband-to-be has been assigned to a case involving a series of suicide bombings, and Abby's spirit guides warn her of imminent danger. Did you know that Abby and M.J. are also available on audio? Deadly Forecast Check audible.com on July 2nd, 2013 for availability. What a Ghouls Wants Check audible.com on December 24th, 2012 for availability. Abby Cooper here to share news of my latest and greatest adventure with you! that,) on a case involving the missing mother of a toddler who disappeared without a trace from her home in the middle of the afternoon. The case was brought to me by a mysterious client who refused to give her real name and took great pains to disguise her appearance but one thing was clear from our meeting; she had a personal connection to the woman's abductor and was living in fear because of what she knew. as always for being such awesome fans!!! The Bellaire Library in Bellaire, Texas will be hosting a children's event featuring Victoria at 1:30 p.m.
series and hanging out with the kiddos! Please check out this link for location address and further details! Saturday July 7th at 4:30 p.m. Please check out this link for location address and further details. and fill in your personalized inscription details. *San Diego - July 12th 7:00 p.m.
Wine, appetizer, and psychic reading event. Reservation required. Please click here for detials about reserving your spot. Ladies, Lunch, Psychic Readings, and Literacy! Reservation required. Please click here for details about reserving your spot. Book signing and audience psychic reading event. Click here for location address and details. July 28th 3:00 p.m. - 5:00 p.m. The Devil I Know. Read this one with the lights on peeps! :) Available August 7th, 2012. If you're reading this letter, it's quite likely that I, Abigail Cooper, did not make it back alive. Back from where, you ask? Well, if I told you I'd have to kill you... Bwahahahahahaha!!! That never gets old! Pause... Pause.... FINE! I'll tell you! Recently, my fiancé Dutch and I were recruited by the CIA to go deep undercover on a foreign espionage mission to recover a missing drone stolen from a military base in Nevada. The drone was a prototype armed with a brand new surveillance system able to pinpoint and target an individual's unique aura from half a mile in the sky. In other words, it's a system that could locate, target and take out any known terrorist the moment they stepped outside, day or night. On the downside, losing it meant that it could be used to take out our president or our allies as well, which is what made this mission to recover the drone so crucial. To that end, Dutch and I were assigned new secret identities - he got slick arms dealer, I got slick arms dealer's flouncy bimbo girlfriend...figures, right? Anyway, within the first 24 hours of our mission we were thrust into dealing with the Chechen mob, dodging an assassination attempt, working a series of dangerous arms deals, trying hard not to get kidnapped, and exposing an illegal gambling ring. And if you think that's bad, you should have seen what happened the day after that! I'd tell you all about here, but it's quite a story, full of twists and turns so I've sent back daily reports to Victoria Laurie who has written it all down and documented it in her new book, Vision Impossilbe out July 5th - just in time for your week at the beach! Or, if you're like me, a week in the backyard with an inflatable pool, a cooler full of cold beer, and hot dogs on the grill. Staycation, anyone? Facebook Chat - July 13th! Victoria will be hosting the Penguin Books' Crime Scene page. To chat live with her on July 13th at 3:00 p.m. Eastern use this link. A Luncheon with Victoria - July 6th! A few tickets are still available for the Ladies, Literacy & Lunch - hosted by Mysterious Galaxy Bookstore. The luncheon begins at 11:30 a.m. at the Marmalade Cafe, 2014 Park Place, El Segundo, CA. Tickets are $65 each, which includes, lunch, two books (Abby Cooper, Psychic Eye & Vision Impossible), and a contribution to Youth Radio. For tickets please call 310-542-6000 or email nicole@mystgalaxy.com. For more details please click here. California Book Signing - July 6th! at 303 North Pacific Coast Highway, Redondo Beach, CA 90277. Mysterious Galaxy Bookstore will be selling all of Victoria's books during this event. Make sure to stop by and get your copy of Vision Impossible and have it signed by Victoria. A portion of the proceeds will benefit the library. See you there!! Houston Book Signing - July 9th! 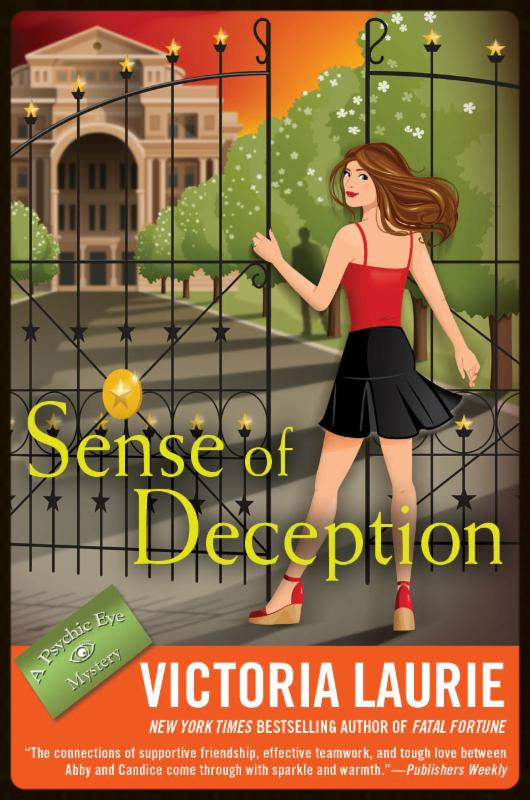 Check out Victoria's hillarious blog post on Sirens of Suspense. Use this link to read it! Did you know Victoria has a Facebook fan page? To check it out and become a fan click here. of foul weather, delicious pastries, and one freaky phantom! me to tell you a little about our latest adventure, but I don't know why she picks me for this detail...she knows that talking about this stuff makes me anxious, which causes a dangerous dip in my blood sugar. losing members of our own team! (Breath mint? we've been on so far, and I would stick around to tell you more, but as none of you are giving up the sugar, I must leave you to go forage for some on my own! Ghouls Ghouls Ghouls Launch Party!!! on December 28th at 6:30 p.m. in Houston, TX at Murder by the Book. and if you tell us a good ghost story, you'll be eligible to win a nifty door prize. Curious about what 2011 has in store for YOU?? Victoria is currently booking appointments for 2011! She's looking forward to chatting with you!! Have you read all the M.J. Holliday Ghost Hunters' Mysteries? some awesome prizes. Winners will be announced December 27th. Click trivia contest to enter. Ian Wigby here. I've come through the portal to tell you a bit about our search for the third Oracle as told by Miss Victoria Laurie in the novel, The Curse of Deadman's Forest - her second book in the Oracles of Delphi Keep series. As I'm stepping forward in time to send you this message, for us back at Delphi Keep it's late summer 1939. My best mate, Carl, and I are attempting to decipher the riddle of the second prophecy written by the great Phoenician Oracle, Laodamia. Within the prophecy, Laodamia hints that the time to venture back through the portal is at hand, and once we embark on our quest, we're to search for a healer who will become the third Oracle within our small band of orphans, working to fight the evil forces of the underworld god, Demogorgon. Laodamia has warned us, however, that our journey will not be without danger. She hints of the curse said to roam the forest where the healer resides. A curse that has claimed many lives and will surely threaten ours. The sorcerer Magus the Black is also using his dark magic against us, and now we know he's been joined not only by his evil sibling, Caphiera the Cold, but also their frightful sister, Atroposa the Terrible. How does it all end, you ask? Well, I'd dearly like to share more, but I'm afraid I must get back to the keep. To discover how it all unfolds, I hope you'll pick up a copy of The Curse of Deadman's Forest when it's released this coming Tuesday, August 24th! This newsletter was sent to registered recipients of Victoria's e-newsletter on June 30, 2010. Hello my friends and fans! Abby Cooper here to tell you a bit about my first spring here in Austin. I wish I could say it was an easy transition, but it's me we're talking about....which means it's never easy! Cold Case Division, which is fitting given the rather frigid welcome I received from the other investigators....ahem! Anyhoodle, as I used my radar to help the squad pull fresh leads from cold cases, my partner and good friend Candice decided she was long overdue for a meltdown, and she and Brice did their on-again/off-again thing with reckless abandon, driving the rest of us straight to Crazy Town. To make matters worse, I got suspended. SUSPENDED! I mean, seriously, you have one lousy shootout with a bad guy your third day on the job and the Bureau needs you to take a little paid leave while they investigate whether or not your killing a man was all "justified" and such...those FBI boys and their pesky protocols....sheesh! After that...well...things REALLY got interesting. But you can probably read all about that on July 6th when A Glimpse of Evil is released.